People are frequently delighted when they wander through our garden to find Maiki and Jaz scurrying around beneath bushes and around pots. They are free to roam the garden and really do not stray anymore than probably five metres max, if that. 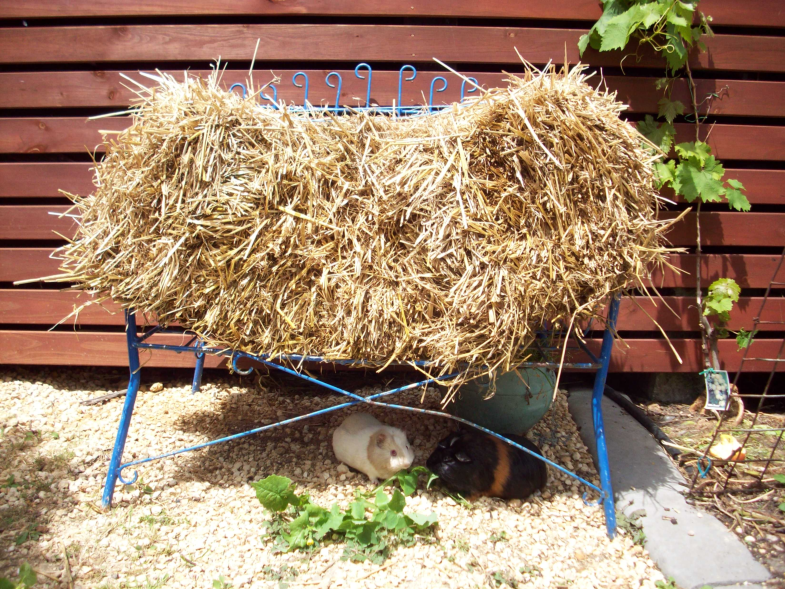 They choose whether they want to sleep in a little grotto area built for them in the garden or under the house. 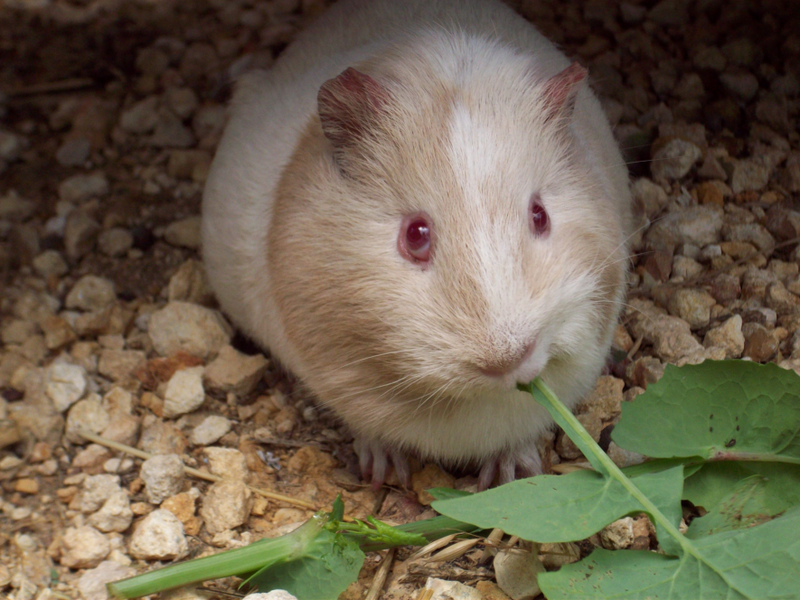 They love to eat the Cape Gooseberries, ripe or not, and also like broad bean leaves. We received Maiki and Jaz after responding to a free-cycle post for a slow cooker. They were also on offer and we weren’t sure what to make of the combination of a free slow cooker and two guinea pigs. Still, my wife brought them home. We really didn’t have any idea just how sick they were. We treated their mange and let them wander the yard and they totally rejuvenated themselves. At first we really thought they were old and on their way out – which is why they were free – but they became so much more active and playful and calmer once the mange was treated and they got good food and exercise. Now their coats are much nicer too. This is Maiki. Maiki is the shy one who is more likely to grab food and drag it off to eat in peace. Jaz, below, is the more inquisitive one and probably the brains behind learning how to get to and extract the Cape Gooseberries from the husks. Both of our guinea pigs are female. 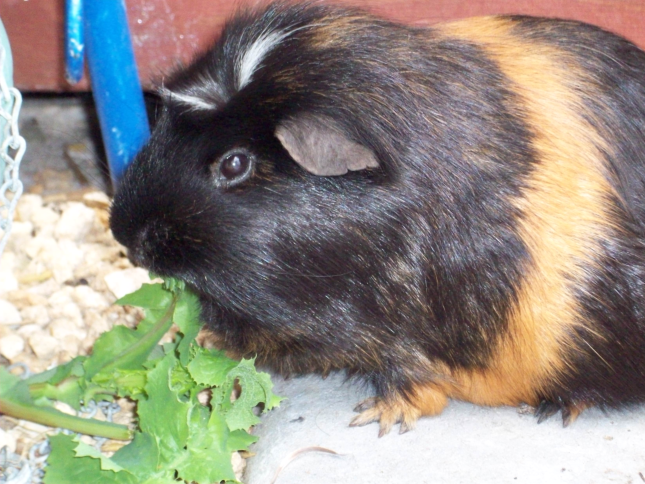 Ten years ago I kept a family of guinea pigs that would live in the shade house located in the centre of the garden of the house I was living in. They wouldn’t stray anymore than a few metres either and they would come out and graze on the sloped lawn. Whenever a hawk flew over they would scurry off to the shade house and take cover. I couldn’t really go back to keeping them in cages anymore. Not for any length of time.